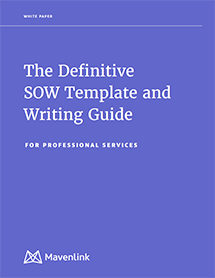 Download the Mavenlink’s 2016 Definitive Guide to Writing Great SOWs for Professional Services. In it, CEO Ray Grainger lays out his takeaways from 30 years drafting successful SOWs. You won’t find information this clear and effective anywhere else. Your guide also includes sample text from Grainger himself, so you see language that works.